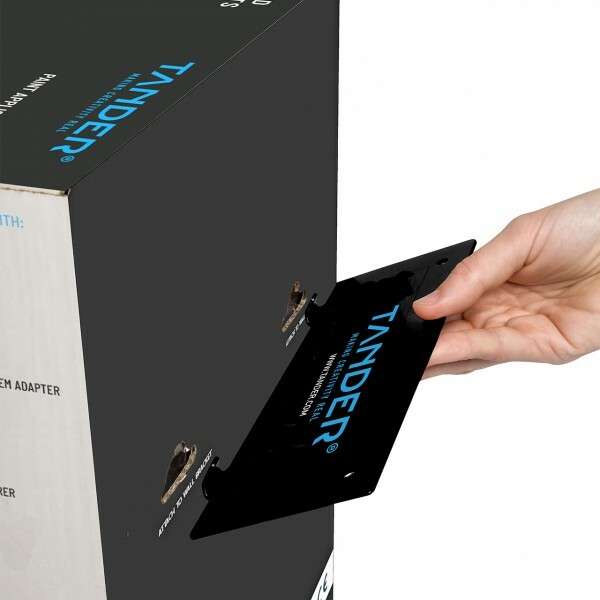 Tander Wall Bracket gives you the possibility to easily attach your Paint Application Lid dispenser box at working height. Attach your Paint Application Lid dispenser box to the wall at working height with the Wall Mount (Attach to the wall with double faced tape or use two screws). Secure the Wall Bracket at the desired location with two screws. Is the Wall Bracket easy to mount? Yes, you simply attach the Wall Bracket to the preferred place. Is the Wall Bracket suitable for all types of Paint Application Lid boxes? Yes, the Wall Bracket can be used for both the 350 ml and 700 ml Paint Application Lid boxes. How do I attach the Paint Application Lid box to the Wall Bracket? Easy does it! Simply punch out the small perforated holes on the back of the box, and place these holes over the two hooks on the Wall Bracket. Open the box and you are ready to go. Can I attach more than one box of Paint Application Lids to the Wall Bracket? No, the Wall Bracket is designed to hold only one box. Of course you can attach multiple brackets to your wall to make all types of Paint Application Lids easy accessible.